I was looking for some kind of crock-pot recipe to take to a potluck. Since I just cooked a turkey, I wanted something with turkey, but didn't really have anything else in mind. 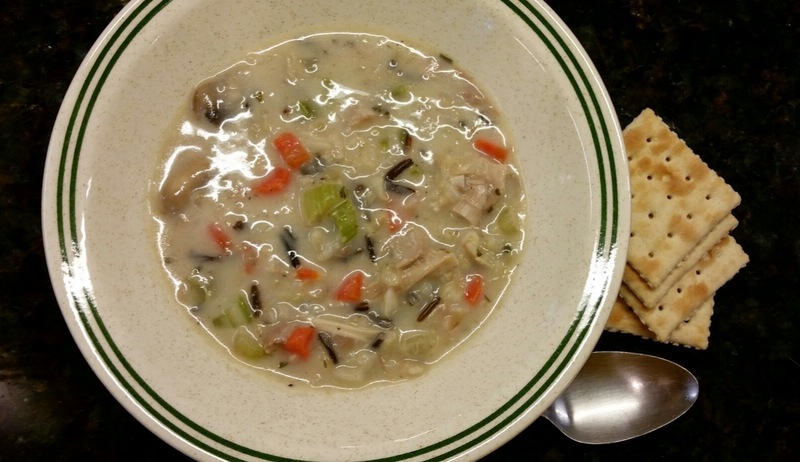 This recipe came up, not because it's a crock-pot recipe, but because someone had made a note that she made this and threw it in the crock-pot on low until dinner time. And that's pretty much what I need - something I can make on a Friday and then take on Sabbath and just warm up with the crock-pot. So, I made it Friday, had some for lunch, and threw the rest in the crock-pot to warm up for the potluck. Good thing I had some for lunch, because there was none leftover to bring home after the potluck. 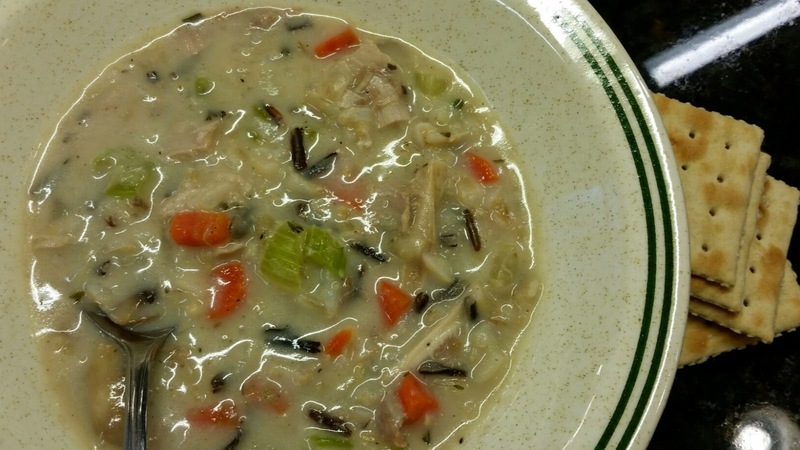 The recipe says it's "a healthier twist on a classic creamy turkey and wild rice soup" but since I've never made any kind of creamy turkey and rice soup, I don't really know about that. 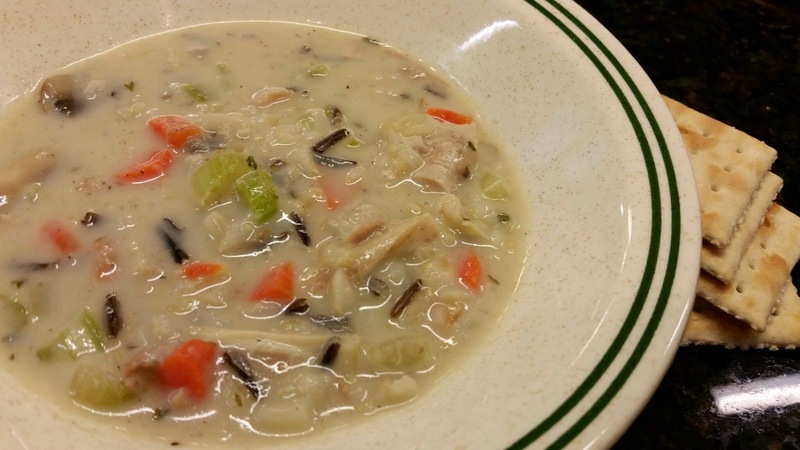 I do know that it's a simple soup to make with a really good flavor, and with plenty of veggies in it, there's no reason why it wouldn't be healthy. Heat oil in a large saucepan over medium heat. Add mushrooms, celery, carrots and onion and cook, stirring often, until softened, about 5 minutes. Add flour, salt, pepper, and parsley and cook, stirring, for 2 minutes more. The original recipe called for 2 tablespoons chopped fresh parsley, which I did not have, so I substituted dried parsley. If you use fresh, add it at the end with the turkey, rice, and sour cream. The rice will take 45-50 minutes to cook; cook it early in the day or the day before and refrigerate until ready to use. Slice mushrooms and chop the rest of the vegetables; store covered in the refrigerator until ready to use.